A hot tub in your backyard is pretty sweet -- unless it's inflatable, because that's kind of redneck -- but a Jacuzzi with a view of something other than your neighbor's above-ground pool, that's just living. 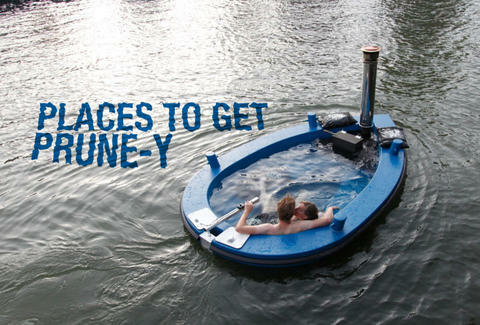 And these 11 mind-blowingly awesome spots for a soak, well, they're other worldly. Man cave? 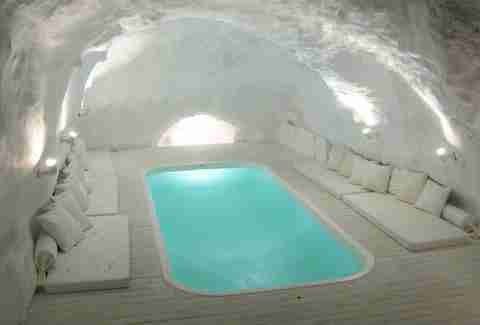 We'll take the spa cave, thanks. That's right, this insane tub with stunning views of the Aegean Sea is cut into the volcanic rock of the Caldera cliffs on Greece's Santorini. 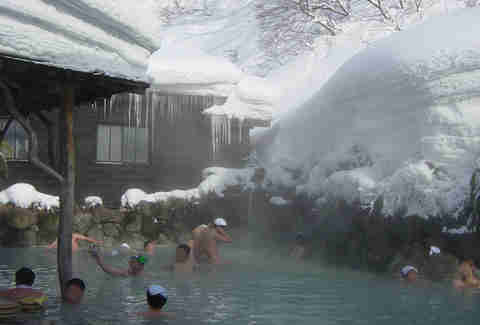 Regardless of whether they named this guys-only spa in the Japanese Alps the "white bone hot spring" on purpose, Speedos are a definite no-no. A wet towel on the head is perfectly acceptable attire however. 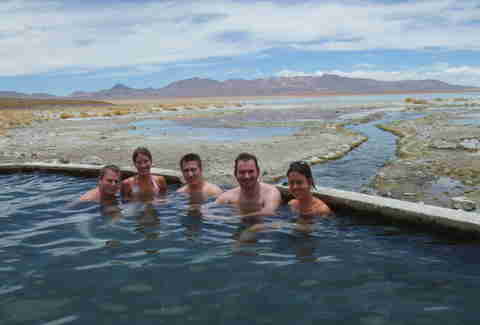 This saltwater tub on the world's largest salt flats in Bolivia feels like a dip in the warm ocean, only it's 2.5mi above sea level. 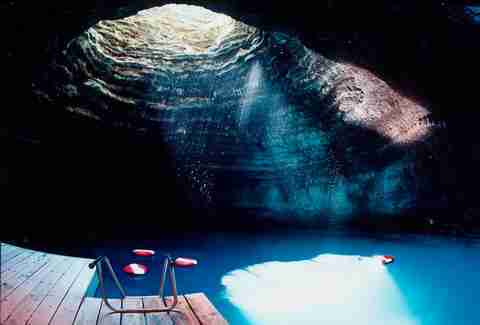 At a depth of over 64ft, this 96-degree underground pool in Utah offers a soak, swim, or scuba package. 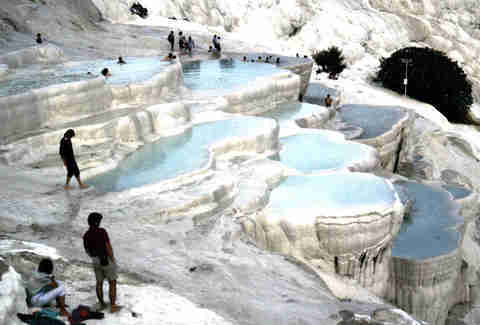 Cut into terraces of travertine limestone in Southwest Turkey, these tiered natural hot springs (whose name translates to "cotton castle" in Turkish) can get as toasty as 212°F. 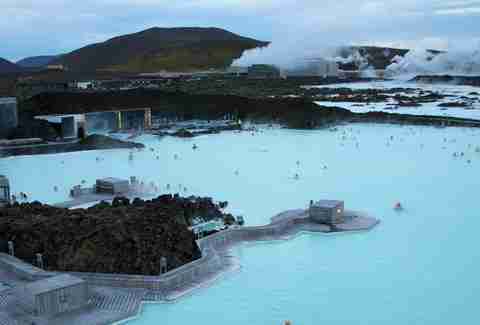 Iceland doesn't just do hot tubs, they do hot lagoons -- heated by volcanos and surrounded by ice, of course. The ones at Blue Lagoon even rock a swim-up bar. 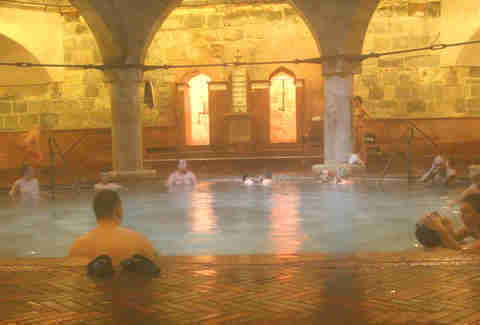 These historical public baths in Budapest are more than 500 years old, so you can only imagine what kind of crazy hijinks Seth Rogan and Craig Robinson could get themselves into here. 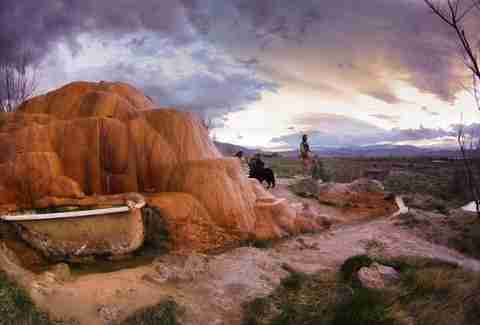 Leave it to a hippy to discover a hot spring and then immediately stick some old bathtubs under it. Well, 16 years later said tubs are becoming one with the rock. Don't you hate it when the parts of you that aren't in the hot tub get chilly? $3,000 per night should solve that First-World problem at Vermont's Aviary Cottage, where they cleverly installed "a natural stone hot tub beside a fieldstone fireplace". Marshmallows included? 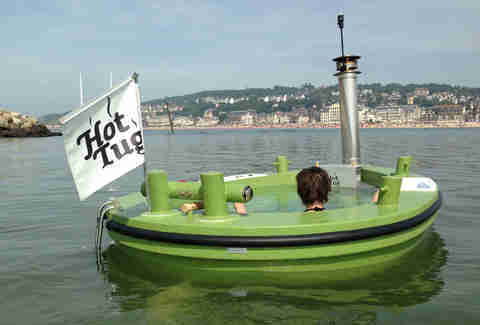 Yep, leave it to the Dutch to build a wood-fired hot tub that can float. Caution: Open seas may cause spilled drinks.